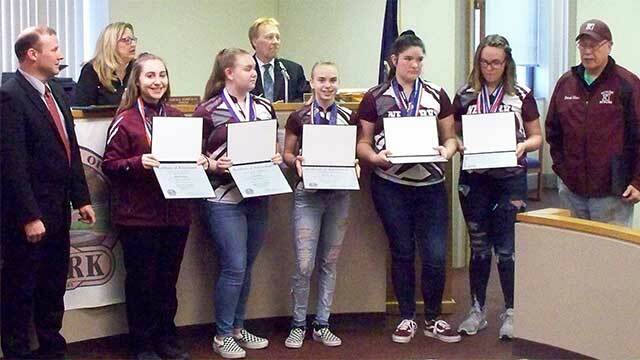 At the March 19, 2019 Village Board meeting, members of the 2019 Newark Girls Varsity Bowling Team were recognized for their outstanding achievements this season. The team, comprised of Emily Spry, Abbie Olmstead, Natalie Kent, Ashley Tack, Rebecca Spry, Emily Lang, and Coach Mark Rowe, won the Finger Lakes League. They advanced to become Section V – Class C Champions and then earned second place in Division 2 of the NYSPHSAA. 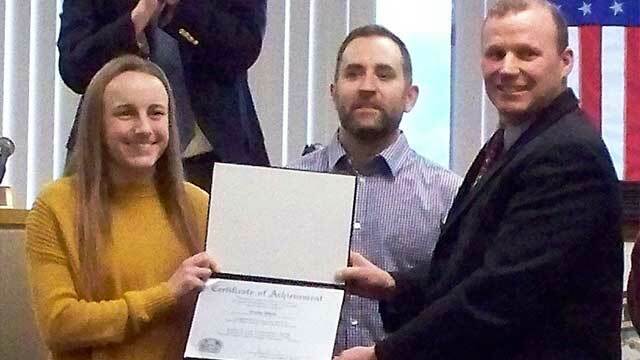 Trinity Wells was also recognized for her efforts during the 2019 Indoor Track season. Trinity was the Wayne Finger Lakes League Champion in the 1500m and the Section V Champion in both the 1000m and the 1500m. The Indoor Track Team is coached by Joe Kopnitsky.